Yeah Yeah I know that we have been lazy about updating out page. But in Luke’s Defense he has been very busy trying to find just the right RV for his Darling Wife Inez. First he had to find a Truck as it was decided that we were going to keep up with the other Gate guards in Texas and get rid of the Motor Home and get a 5th wheel. Mission accomplished on the truck. 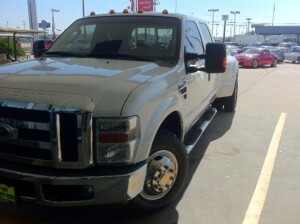 Got a Ford F350 Dual wheel 1 ton. golly he did it once again with the help of that wonderful Lady Inez we settled on a 2012 KEYSTONE ALPINE FIFTH WHEEL which has every thing that we wanted and then some. Now next Monday our boss Roger has agreed for us to take a week off from the gate to go to Katy Texas to pick it up from Holiday World and return back to our gate on the following Monday. Now to the Gate guard business they finally finished up well #1 and over this past week-end and this week they moved the rig to is new location here on the Schwope Ranch to drill another well. They now have that task completed and started the drillbits and pipes turning this afternoon at 4:30the they hopes of having the surface drilling completed to a depth of 4000 feet and by Sat or Sunday they plan on installing the casing for that part. We got 5 loads of casing pipes in this morning and 4 cement trucks along with the large cement tanks tha they use for the operation of cementing in the casing. So seems as though they planing on the first drilling to move right along. We will try to keep you posted ont here status mind yo we will be gone a week but we will continue to do the best we can with what we have .Check us out. Hey congrats!! We’re looking at doing exactly the same thing. Well it took a while to convence myselfthat we would be better off with a 5th wheel over a Motor home but are glad that we did now. Heidi’s going to have truck envy when she sees this! She SO wanted a Ford instead of a Chevy! Can’t wait to hear all about life in your new RV. I know you two will love it! It sure looks like a beauty! Safe travels! 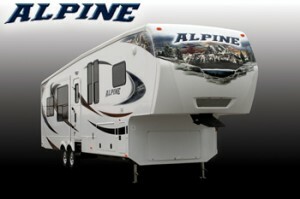 Yes we traded for a new 2012 Alpine 5th wheel and Loving it ,, the motor home was nice but after almost 7 years in it full timiing it got close with only 1 slide out. Yeah we just Traded this last week for a Keystone Alpine It got a bit close in that Motor Home after full timing for so long in it. It was avery good experence but I think we are going to enjoy the 5th wheel more with the 4 slides. Well Thanks Wayne and Sue we will be waiting with bells on and the coffee to if you drink it. We are looking forward to getting over to Katy and taking receipt of our 5th Wheel, The wife is as Nervous as a cat on a hot tin roof as normally we just hook the truck on the back of the motor home and go but this time she has to drive and follow me.